Marks & Scars White with ginger chin and light hazel eyes. Where Lost High Ridge Woods Southwest of Brockham. Last seen heading North with black flexi lead attached. Other Info This is a rescue dog who is very nervous and may be difficult to catch. He is not aggressive. He could have travelled a considerable distance from where he was lost near Brockham. I am so sorry to hear the sad news of Bobby. I searched the woods every day for him as I walked my own dog. My father passed away 3 weeks ago and looking for Bobby gave me a specific reason to go out every day, hopeful that I could be of help. I understand the wonderful Jenny Brown (www.k9tracker.co.uk) was not getting messages sent to her asking for help. Maybe owners could try again - Bobby could be trying to head home, even if he hasn't lived there long. volunteers continue to put out food and camera hoping to catch sight of Bobby. there have been no recent sightings. the kind people who attended on sunday did not find anything new. Nick continues to search woodlands around the area and fields, increasing his search area. Fran and Tony have been advised to hang their others dogs bedding and scent items at their home until they move house, due at end of this week. There is very limited parking (approx five spaces) in the HR woods car park. Anyone who is kindly going to help with the search tomorrow would be best parking (safely) in laybys on surrounding roads such as middle street and Roothill then walking in to the woods from there. I've been walking through the undergrowth. The forestry commission did a lot if work 3 weeks ago strimming round the newly planted trees so it's much more open in certain areas. I know the farmer is checking his barns regularly just in case.I will keep looking for you every day. Thank you. It was Brockhamhurst Lane. We have left some of our clothes just the other side of the little wooden bridge. He was also seen in root hill lane. People are now searching denser areas of the woods incase he is caught up . It’s been 9 days now and the thermal image camera they went out with the other night showed nothing. From Dog Lost Surrey page from the very kind people who are searching for Bobby - for anyone who is walking in the area Bobby went missing from "We would like any dog walking folks to actually go into the very wooded parts, ie not stay on the paths. go " off piste" as much as is safe and practical. Looking low, around trees trunks and shrubs . Checking to make sure Bobby is not wound around one, and can't move. Also look for evidence of the remains of the flexi lead, and or collar. ( if he hasn't been eating, he might have been able to slip out of it). Bobby also might be tucked down low in any of those numerous hedges ditches, or under piles of wood to scared to move because the flexi lead is chasing him. It's urgent that we do this"
Dear Fran. I live near high ridge woods and am walking there every day twice a day. I'm desperately keeping an eye out for Bobby. There are no pheasant pens in these woods but there are pheasents running loose. Keeping my fingers crossed that one of us see him as there are a lot of local folk keeping a look out as we walk. We all know how we would be feeling of he was ours. I have no idea. I certainly haven’t seen any. I just hope he’s managing to eat something. Just wondering if there are any pheasant rearing pens in that area - I've never actually walked in Highridge woods. If so, the young birds are pretty stupid at this time of year so Bobby will have a fairly easy food supply. Maybe look out for signs of feathers, bones etc where he might have made a kill? Bobby has now been missing for 6 days with no further sightings. We are assuming he is still hiding in the woods and are searching there morning and night when it’s quiet but no luck as yet. We ask that everyone in the local area keeps looking for pissible sightings in gardens fields etc. Thank you for all the updates Fran. In view of where you live, it might be a good idea to focus more southwards.....Holmwood Common etc. Some people have used drones to spot missing dogs and Bobby's colour would show up quite well. Was his lead attached to a collar or harness? Have you informed Network Rail too? Although well fenced, there is the Dorking to Holmwood track quite close and it has footpaths crossing it via stiles in several places. Not impossible, but very unlikely, I think. Poster around the area he went missing, and post flyers through doors there too. He may have taken refuge near where he went missing, or is hiding in the woods. when searching for him wear the same deodorant/perfume you use on day to day basis, as he will recognize the scent, and your the one he trusts. And of course take with you his carrier. COULD A TRACKER DOG HELP HERE? Paws xd. Bobby has only been in England since August and he was lost 20 miles from where he lives. Do you think he could find his way from Brockham where he had never been before to Billingshurst?? Is that possible? It's not impossible for Bobby to make his way home provided his lead hasn't got caught up anywhere, so can he get close or in to a garden area if he does get back? If you have a garden, leave the gate open. If you have a little are outside up under cover, you could try hanging dirty clothing out there to help the scent to waft ( if you have to leave in the rain, it's better than nothing. Will continue to share etc, good luck. Thank you Julie. I could try I suppose but I’m not sure how long his bed would last in a car park in the woods and if it’s pouring with rain would it not wash away any smell? The dog roamed the streets for 3 years and he was original seen by tree cutters bolting very fast through the forest. I can’t heko thinking he is mikes away now in which case no one would recognise him . But I’ll try and get a blanket there. I live 20 miles from where he was lost . For those asking, I am the owner of Bobby. I really appreciate all the help being offered. As time goes on I am getting increasing worried and distressed as you can imagine. Please note the following. He was lost by my dog walker in High Ridge Woods Brockham. This is 20 miles from where I live and therefore he is not at all familiar with the area and nor am I. He is a rescue dog from Greece who spent 3 years roaming the streets so it is in his mentality to roam. He is also very wary and nervous of strangers and I believe that he is either hiding in the area or has run miles away by now in which case noone will know about him. We are putting up posters in the area where he was lost and posting leaf;ets but if he has run miles this will not help. All vets and the dog warden have been notified as has Pet Log. I am very very worried that he hasn't even been spotted yet. If anyone does see him I'm not sure how easy it will be for anyone to actually catch him. All I can ask is that people keep looking and sharing and pray he is found soon. I am not the owner but I do know her and am in contact with her. We are currently searching the area on the assumption he may be caught up in the undergrowth near Tweed Lane, although it's also possible he is actively avoiding human contact because he is a rescue dog and very wary of strangers. If he was still running around there would probably be more sightings of him. I have also asked Jenny Tiga Brown if she can help, in case this boy is caught up somewhere. It would be really helpful to have some feedback from the owner? Walked across the fields behind Brockham village and a part of the coach road yesterday - put up 8 posters. Sorry I can't do more but struggling with a virus. 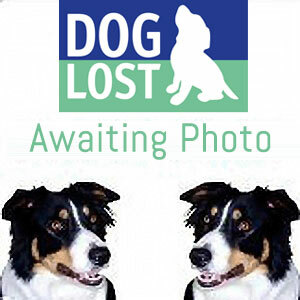 Owner needs to poster Betchworth Golf Club, Dorking Golf Club, the Deepdene Trail, Medivet in Brockham. I have sent link to Mole Valley Dog Warden (very good!) and to a dog walker based in Brockham plus other local people. Printing some posters and planning to walk the "coach road" this afternoon. It might be worth contacting Betchworth Golf Club? Alerts sent to helpers in RH2,3,4,5.